Eventually, the electronic hobbyist find themselves needing more complicated tools. One need that arises is to view into the world of the electronic pulses and gaze upon the communications. One simple example of such a digital communication is an IR receiver. A more complicated example would be a I2C bus or UART communication. All of these can be addressed fairly simply with a logic analyzer. * SUMP Protocol Implementation for Arduino boards. * NOTE: v0.09 switches the channels BACK to pins 8-13 for trigger reliability. * Please report any issues. Uncomment USE_PORTD for pins 2-7. * of PORTD. Bits 0 & 1 are the UART RX/TX pins. * On the Arduino Mega board 8 channels are supported and 7k of samples. * if something else works better for you. * without the device profiles, then you will get a "device not found" error. * 120 Ohm or you may damage your board. * NOTE: Preliminary RLE support for 50Hz or less exists, please test it. * until after the trigger fires. * Please try it out and report back. * Release: v0.09 June 22, 2013. * Function prototypes so this can compile from the cli. * PORTD support with triggers seems to work but needs more testing. * SUMP commands are either 1 byte, or for the extended commands, 5 bytes. * set debug pin (digital pin 8) to output right away so it settles. * properly pad out the sampling routines. * so we don't erase the data or do anything for a reset. * Zero out any previous samples before arming. * Done here instead via reset due to spurious resets. * captureMicro() instead of triggerMicro(). * we can just use it directly as our trigger mask. * defines whether we're looking for it to be high or low. * so that << 16 doesn't end up as zero. * to return and delayCount number of samples after the trigger. * return all samples starting from the trigger point. * samples from before the trigger fired. * We return a description of our capabilities. * Check the function's comments below. * a couple of debug commands used during development. * previous commands out of the buffer. Clear the sample data as well. * Just send a '0' from the Arduino IDE's Serial Monitor. * This is used to see what commands were sent to the device. * a debug printout. useless except for development. * This dumps the sample data to the serial port. Used for debugging. * 4 bytes of the command. * If we're debugging we save the received commands in a debug buffer. * We need to make sure we don't overrun the debug buffer. * This function samples data using a microsecond delay function. * a busy loop waiting for the trigger conditions to occur. * reads the port as fast as possible waiting for a trigger match. * trigger values. All conditions must match to trigger. * at the appropriate rate. * basic trigger, wait until all trigger conditions are met on port. * this needs further testing, but basic tests work as expected. * disable interrupts during capture to maintain precision. * cannot have any interrupts firing. * toggle pin a few times to activate trigger for debugging. * this is used during development to measure the sample intervals. * Arduino digital pin 8 is being used here. * since our loop takes some time. The delay is padded out by hand. * one by hand too. * is done for any triggers, this is effectively the 0/100 buffer split. * which is limited to 16383 microseconds max delay. That is about 62Hz max. * This is only used for sample rates < 100Hz. * function eventually that uses the circular trigger buffer. * very basic trigger, just like in captureMicros() above. * clock might be ok but all of the timings would have to be redone. * 1MHz case. We can't really do it at the moment. Timing is too tight. * This should be retested on a 20MHz clocked microcontroller. * The data is flat out wrong for the 1MHz case. * 500KHz case. We should be able to manage this in time. * busy loop reading CHANPIN until we trigger. * without pin toggles, will try 1 nop. * between the trigger point and the subsequent samples. * to get precise timing, at least for the after trigger samples. * before trigger samples and the after trigger samples. * is where we should start dumping since it is circular. * our buffer starts one entry above the last read entry. * This function calculates what delay we need for the specific sample rate. * The dividers are based on SUMP's 100Mhz clock. * result is 1,000,000 saying we want a 1MHz sample rate. * samples gives us the sample rate per second. * So for 1MHz, delay = (99 + 1) / 100 which gives us a 1 microsecond delay. * For 500KHz, delay = (199 + 1) / 100 which gives us a 2 microsecond delay. * response to the OpenBench Logic Sniffer extended get metadata command. * interesting variables and the debug buffer. * of the sample buffer. 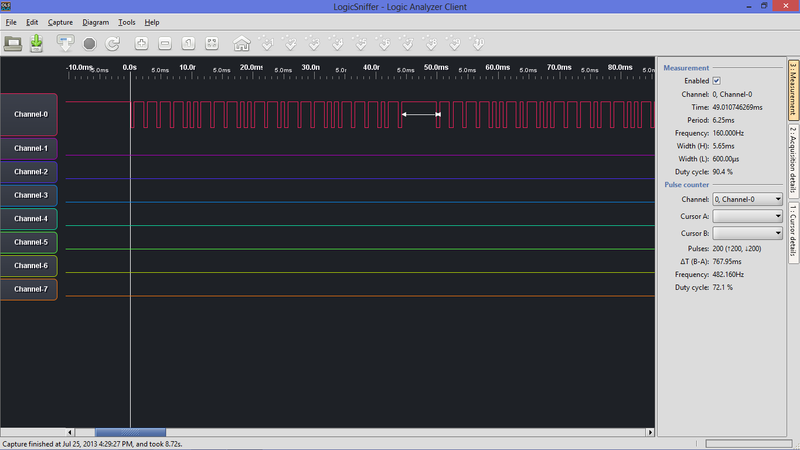 The unmodified ATMEGA328, ATMEGA1280 and ATMEGA2580 (Not ATMEGA1284 compatible) version can be found at https://github.com/gillham/logic_analyzer. Next, we will need the Java application that will be run on the PC. This OpenBench Logic Sniffer (OLS) will need Java JDK to run. # The device's native clockspeed, in Hertz. # Whether or not double-data-rate is supported by the device (also known as the "demux"-mode). Note: If you use Wordpad or Notepad, remember to verify the hidden “.txt” is taken off. You can click on the “Show device metadata” to test the connection. Next click the Triggers tab. A little tricky here. This is the signal you will want your trigger to start capturing with. For this example, The checked Mask 0 is for Channel 0 and the unchecked value is 0 or LOW. The unchecked Mask 1 is for the Channel 1 pin and it’s value is 1 or HIGH. Since Channel 1 is not checked, it will be ignored and the trigger will only activate when the signal goes from HIGH to LOW. After all this setup, you are ready to capture. 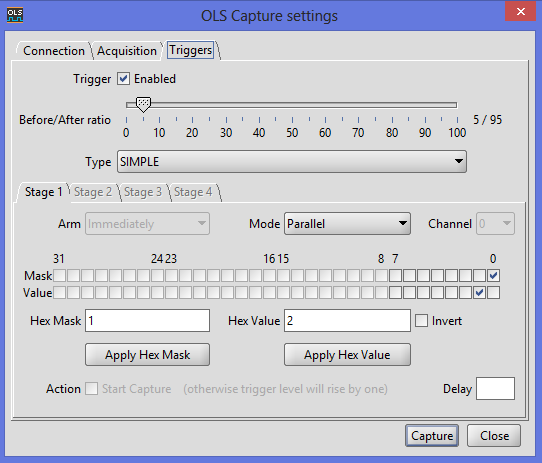 Pressing the <Capture> button should bring you back to the main graph display and it should wait for the trigger to occur. My setup is a simple IR receiver with the signal connected to pin 22 (Channel 0) on a breadboard with my MEGA-1284. The signal chain may be smashed together, so zooming may be necessary. Right clicking on the channel labels will allow you to resize the Y-Axis to gain this appearance. Next, we shall process some UART signal. Posted on July 25, 2013, in ATmega1284, Breadboard Arduino, Project. Bookmark the permalink. 1 Comment.